If you own a bread machine, I’m sure you know that most bread machine bread recipes produce tough, dry and crumbly bread. If you’ve tried the bread recipes that came in the bread machine instruction booklet, you have probably gotten extremely discouraged and put away your bread machine in the far corner of your bottom cabinet.Well, come on and take out your bread machine! Yes, you can make a nice soft white sandwich bread at home with your bread machine if you follow my recipe! It won’t produce the same texture as the preservative-filled “Wonderbread” in the plastic packages, but it WILL make a delicious soft bakery-style white bread. This white sandwich bread is very easy to slice, doesn’t crumble and makes outstanding sandwiches! Warm the water in the microwave until it’s barely warm (NOT hot). Pour the water in the bread machine. Pour the oil in the bread machine. Put the flour in the bread machine. In one corner of the bread machine (on top of the flour) put the sugar. In another corner, put the salt. In another corner, but the yeast. Set the bread machine menu to “Sandwich” option. If you don’t have the “Sandwich” option, then use “White”. Set the loaf size to 1 1/2 lb loaf. Press the Start button, then come back in 3 hours to a hot loaf of homemade white soft sandwich bread 🙂 As a bonus, you’ll get to enjoy the delicious smell of homemade bread all over your house! 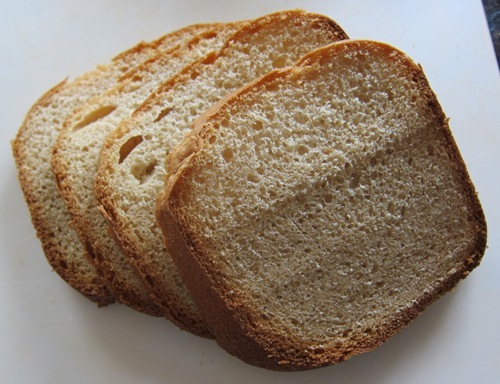 To slice the bread, use a large serrated knife (the one with the jagged edges). Pumpkin Bread Recipe – Easy And Best Ever! Love this great recipe! Thanks for sharing. What fantastic looking bread! I don’t know if I’m ready for a bread machine, but this looks tasty. Thanks for commenting on my blog. 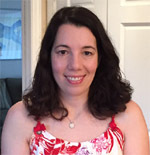 I’ve added yours to my Google Reader and look forward to reading your future posts. I tend to minimize the number of gadgets in the house. I cook in a very tight kitchen. The bread does look great! I love homemade/breadmachine made bread and my kids prefer it much more than supermarket bread, which I try to only buy in an absolute emergency. I have a recipe/guide on my site for the rapid bake loaf for Panasonic Bread Machines which gives nice results. Do you use regular flour or bread flour? I used both regular and “better for bread” flour and didn’t notice much difference in the bread. I was one depressed soul after my bread making attempts failed and was planning to give the machine the bottom cabinet status. 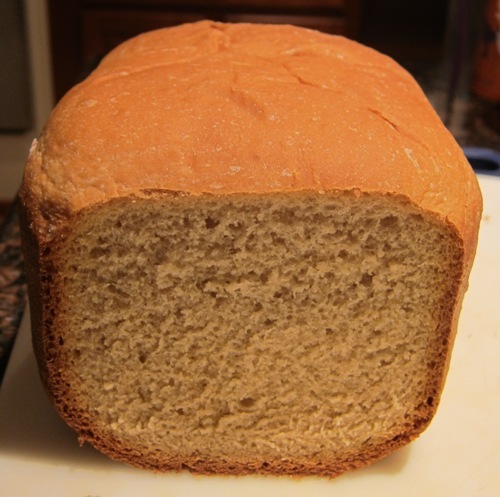 Then I landed on your blog and many thanks to you…I made an almost perfect bread. I would like be post it on my blog soon with your permission to use the same ingredients. Thank you so much for saving my bread maker from a tragic end and for the lovely bread we enjoyed. I’m happy that you liked my bread recipe! You can post it on your blog, as long as you mention the source of the recipe and the link to my website. 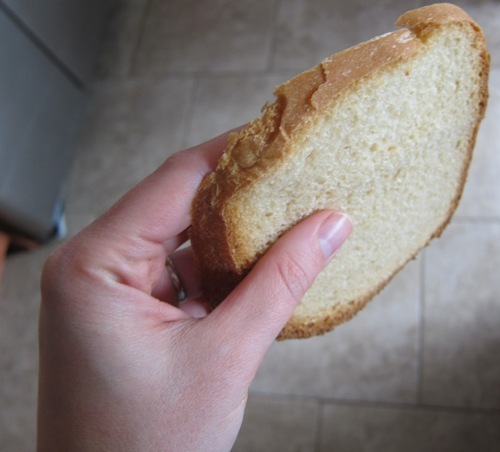 I just tried your white bread sandwich recipe and it turned out great! Thanks! Thanks, Stephanie! I’m happy that you liked the recipe! How long did you bake it in your bread maker for, and what loaf size (i.e. 1.5lb, 2 lb, 3 lb)? I followed the recipe and baked it as a 1.5lb but it came out fairly doughy (no complaints) but fell apart in the middle. 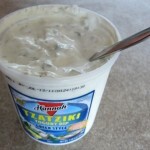 I love the taste and the texture though so I wonder if you have any suggestions? Thanks! Your suggestions worked wonders! The bread is just as amazing! 2.0 lb size on white setting, light crust! Thanks, Maddie, for coming back and posting! I’m glad it worked! Delicious bread, just what we have been looking for. If I wanted to do a mix of bread flour and bread whole wheat flour do I just substitute 1 cup or will I need to adjust other ingredients? Also my bread was a little to airy, my kids said their sandwiches didn’t stay together well, any suggestions for that? Thank you for sharing! Just use 1 cup of whole wheat flour and 2 cups of white. Try doing what Maddie did – bake on 2 lb settings with “Light Crust” option. This recipe is so holy cow good! I just made the dough in the machine then took it out and cut the dough into small pieces. I rolled them into balls and put them on a greased cookie sheet and baked them for 30 minutes. It made THE BEST sandwich buns!! Making a loaf today since the husband said he’d like to have it loaf-like too. Thank you so much for this delicious recipe! Thanks Iris! What a great idea to use this recipe for the buns! This is the best bread I Have ever made in my bread machine I was looking for a bread that my very picky 8 yr. old would eat and I think I have found it thanks so much. So glad I have found your site. I am going to try your oatmeal bread next. Thanks Anissa! I’m glad that you and your child liked the bread! I’m at it again. LOL Made your soft sandwich bread dough in my machine. Took it out when the “dough” cycle was done. Cut the dough into about 4 inch pieces, rolled them into long rectangles. Made a spread of butter and brown sugar. Spread that on the rolled out dough. Some of these I put chopped nuts on, some just cinnamon, and some I used the brown sugar spread with some home made peach preserves cinnamon and a few nuts. I rolled up the dough lengthwise and curlled it into a roll (like a cinnamon roll). In muffin tins I buttered the sides then put in a small amount of the butter brown sugar mixture and then placed the curled roll in the tin. Baked at 35 for about 15 minutes. Made a simple powdered sugar glaze and glazed them when cooled. These are without a doubt the best sweet rolls I ever ate. Thankyou again for posting this recipe. Oh, by the way, we made your pizza dough too and made 2 calzones with it…. YUM! You are awesome! Thank you for taking the time to share! The sweet rolls sound so yummy! I love how easy it is to use my bread machine, but the bread it produces just isn’t great for sandwiches so even after investing a lot of $$ in a bread machine, I’ve been forced to buy bread from the supermarket. I was SO thrilled when I found your recipe. My bread machine does not have a Sandwich setting, so I used the 2# loaf with light crust setting that was suggested and it came out so soft and delicious. No more preservative/junk filled supermarket bread for us! Yay! Thanks, Janelle! Homemade bread is so much better than the supermarket, especially when it’s still warm! Thank you so very much for your soft bread recipe. I have been on the search for this for the longest time! I substituted the vegetable oil to olive oil and measured the ingredients for a 1 pound loaf. It came out amazing and we just finished a great picnic (with my traditional home-made coconut jam) at home on a Saturday Rainy afternoon. Thanks again Melanie! Thanks, Audrey! I’m glad you liked this soft bread recipe, and the home-made coconut ham sounds really delicious! Thanks for sharing! I will try to make this sometime this week! Only thing is, I wish my bread machine produced loaves that are even in color. Tops of my loaf are always like 2 shades lighter 🙁 May I ask what kind of bread machine you have? My bread machine brand is Sunbeam. Thank you for this great- finally first time successful bread machine bread recipe! I tried your 1cup whole wheat, 2 cups white flour and that worked really well. How can I add nuts or seeds or oats or something interesting? Thanks! You can add nuts or seeds, but not the oats. The oats will soak up the liquid and will mess up the recipe. Bread machines usually make the beeping sound after it mixes the dough the first time, and that beeping sound means you can now add nuts or seeds. To add nuts or seeds to the bread, just throw a handful of them in the bread machine. Consult your bread machine manual to see if it has the beeping sound for nuts. If the bread machine doesn’t have this feature, just add nuts and seeds right away, along with all the other bread ingredients. We are having money problems so I have to use what I have on hand. One of those things is my bread machine. I just pushed start. I am excited for the results. BTW, I am totally going to use your recipes (pizza dough, pita bread, etc.) Thanks for a great site. This is the best white bread recipe I have found. With the problems that are happening over here in Cyprus now the bread machine came down from the shelve. Unfortunately it only does the making of the dough but fuses all the electrics when it bakes. So this recipe is being used to make white rolls. They are fantastic, look like they come from the bakers but taste 100 times better. I use our own olive oil from our olive trees and Lidl’s type 550 wheat flour and I cannot believe how lovely are. Very grateful for this recipe. Thank you for sharing. Thanks for your comment, Loise! I’m happy that you like the recipe! Enjoy those homemade rolls! This was such a good recipe. I had no vegetable oil, so I used canola and it turned out so soft and good. The best loaf for sandwiches I have made. Anyone know of a good soft wheat bread recipe? 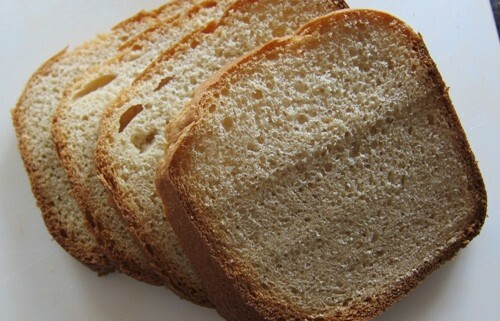 For the whole wheat bread, you can use the same recipe, except use 1 cup of whole wheat flour and 2 cups of white flour. I came across your site while looking for a tabouleh recipe on pinterest, and WOW I struck gold! So far I have made the tabouleh and tomorrow will be making hummus, pita bread and next week the bread machine bread. Wish I’d found you a long time ago. Thanks for all the wonderful recipes. Thanks, Helen! I’m really happy that you like my site! For some reason my bread is turning out more dense than it did before- less and smaller air pockets- and the crust comes out kind of bulbous and odd shaped rather than smooth and round. It’s strange because I used your recipe last month and it worked great- any idea what I’m doing wrong? I’m using 1c whole wheat, 2c white, and olive oil as my oil. And I keep my yeast in the fridge. Thank you, thank you, thank you! I was about to give up on my bread machine until I tried your recipe. I made the dough in the bread machine and then baked it in my oven. It came out perfect! Light and fluffy and better than any store bought bread I have ever tasted. Thank you so much! Thank you for leaving a comment, it’s always nice to hear that people use my recipe! I’m glad you liked it! The most likely cause of the bread not rising properly is the yeast – maybe it’s gone bad. Before making the bread again, “proof” the yeast – dissolve 1 tsp of sugar in 1/4 cup warm water, then sprinkle 1 tsp of yeast on top. Leave for 10 minutes, then check back – the yeast should foam. If it doesn’t foam, you need to buy new yeast. If it’s not the yeast, try reducing the amount of salt to 1 tsp, or using only the white flour. It could be also be the humidity changes in the air that affect the bread too. With the bread machine yeast, use the same amount as active dry yeast. I tried your recipe and it was amazing. Thank you so much! I even baked it on the grill because my breadmachine broke. LOL. I just put it in the pan as normal, turned on the two outer burners to high, and put it on the highest part of the grill. Turned out perfectly. Thanks, Maryann! I’m glad you liked the recipe! Hi! Just wanted to add an update to my earlier feedback. This is the only non-fruit bread my picky teen has asked me to make. She loves it and has asked for it instead of store bread. This is the only recipe she’s *ever* done that for and I’ve tried a lot of them. Fabulous! Delicious as chicken sandwich or chocolate spread! Even my son who’s a picky eater loves it’s! Thanks so much. I just wanted to thank you for sharing this. Needless to say it turned out great! I wanted a smaller bread for just the two of you so I just made half of the recipe above and it turned out great on 1lb. setting. Thanks so much, Melanie. I planned to sell my bread machine because the first time I used it I got a weird-shaped hard bread. Fortunately I found your blog and this amazing recipe. I made one today and it turned so good. My picky little daughter ate 4 slices with peanut butter and jam. Again, thanks so much. Be blessed! Thanks everyone for your comments! It’s so nice to hear that you like the bread! I found out your bread recipe is simple. As a first time user of bread baking machine, I am nervous. But I will try the recipe and let you know the results. I have just ordered a 1 pound bread machine which will arrive tomorrow. I would like to make your recipe but since I have ZERO experience I wonder if you could help me make the appropriate conversions to the ingredients list. I am afraid I won’t get the amounts right. What size loaf option should I use? My machine makes 1, 1 1/2, and 2. Hi Melanie, thanks for the instructions! finally, i an able to get some decent bread from my breadmaker machine! i tried several methods before and this worked better…not sure if its due to the separation of the salt,sugar and yeast or is it due to the different flour i used or the warm water…but stilll wanna thank you for sharing! It’s 1 1/2 lb loaf. I am kind of discouraged by many failed attempts on other recipes. Having read through so many great reviews of your recipe, I would really like to try out on my machine once again. However, my machine does not come with pound setting. It only has 500g, 750g, 1kg for the size of loaf. Appreciate if you advise how I can advise your ingredients to fit the weight setting I have in my bread machine. 500g is roughly 1 lb, so you’ll need to use 750g setting. Thanks for the great recipe and tips. This is the first successful bread that I have ever made from my bread machine. Crust is soft and not crumbly. Bread is also soft and tasty. Thumbs up. My family loves it! We don’t have a bread maker, how would I make this recipe using the Kitchenaid mixer instead? Just made this tonight. Tastes great. Great texture plus loaf looks great! This is legitimately some of the best bread I’ve ever eaten. I had to laugh at your description of what it’s like to have a bread machine because the back of the bottom cabinet was EXACTLY where mine was lurking. This bread is soft, chewy, and utterly delicious. I’m curious how it will turn out with different flour types, but I’m happy to know that I can make great bread at home. After many failures, for the first time I made a decent loaf of bread following your recipe and instructions. My family and I loved the bread. Thank you ever so much. Have used this recipe three times, first time perfect but the next two were what I would call dence. Could you please help. Have used identical ingredients for all three. Probably the yeast has gone bad (the 2nd and 3rd time). Please try again with a brand-new yeast. The best bread recipe ever. I don’t know where the secret is, but is perfect. So soft and tasty. Thank you for sharing. I just got a bread maker yesterday for my birthday. I’m making this recipe as I’m writing this. So far, so good. Will let you know how it turns out. Thanks for the recipe. I made this bread recently and the flavor is beautiful. A great texture. This will be a go to recipe for my family. Thank you. My husband and I love this bread! My husband loves this recipe above all the other ones I make in our bread machine. We use this recipe all the time. Awesome! I was hoping to try this but my machine doesn’t have a sand which or white setting….it also does not have a size setting so I am not sure how to try it. Would a basic setting work? This recipe is exactly what I was looking for to make sandwiches for my husband’s lunch! My only substitutions are that I use one cup of milk instead of the water and 3 tablespoons butter instead of oil and 2 Tablespoons and 1 1/2 teaspoons of sugar since it is a little on the sweet side. The bread comes out so soft and fluffy, soft crust and just all-around delicious! Thanks so much for the recipe! I was wondering if anyone has taken it out after the rising and used this recipe for rolls, or maybe hamburger buns? I made this yesterday for the first time and it was wonderful for our French toast dinner! I think I will use the leftovers tonight for garlic bread! Okay, I had to leave you a comment. This bread is so perfect in every way. It’s 1000% times better than the recipe that came with my bread machine for white bread. Oh my gosh. Your bread recipe yielded me a loaf exactly like the ones that come out of the grocery store sans the preservatives and chemicals. I can’t thank you enough for sharing a recipe that actually works. It was wonder-bread soft. I mean it was fall-over soft. I cut a piece and it fell over perfectly as I continued to slice. Oh oh oh my gosh. I just love it. It’s the first loaf I ever made that came out right and that I also finished in less than 3 days. Some of it was for french toast and the rest I made sandwiches out of. I never have to buy bread out of a grocery store again. You are a lifesaver and although I do not have kids of my own, I have nieces and nephews and now feel good that my homemade bread will be create a lifetime of memories. This recipe is officially a family heirloom for me. Peace and blessings! Hi! 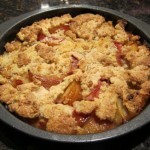 I am exciting about trying this recipe because the crust on the bread I make is usually hard and the bread is crumbly. Do you use all purpose flour or bread flour? I hardly ever make a comment on recipes but this one is worth my time! This bread recipe is AMAZING!! I finally have good homemade bread from the bread-maker that my kids will eat! THANK YOU! My dad used to make bread in a bread machine for us before he and my mom moved out of state a few months ago. During their move I took one of two bread machines he had. I started missing the homemade bread and the smell of it lingering around the house, almost immediately. I Google searched about a dozen recipes after not finding Anything specific for my newly acquired DAK model FAB 100. Needless to say, this recipe was one of the dozen saved to bookmarks. After about a month I decided to give it a try because “What could possibly go wrong” is all that I could come up with and decided to use this as my first ever experience in bread making. The answer to that question about 3 hours later was “Nothing”. The bread that I am eating right now, right out of the machine, is fluffy, soft, cooked all the way through with a great light crust, and is so perfect that I had to leave a comment and say Thank You, Melanie! The kids will absolutely love this bread in the morning and I’ll be making more for dinner. Hi! This makes amazing bread.. best I ever tasted in the bread machine! I tried to experiment and use 1/2 whole wheat flour and 1/2 regular flour but it was not as fluffy. Do you have any adjustments I could try? I was skeptical about the recipe for two reasons: 1) I do not have a “sandwich” setting; 2) My bread machine manual has me add all of the ingredients except yeast before the flour, with the yeast going on top. The manual implies that the order of ingredients is critical. I thought that I would try it anyway. I like my regular white bread recipe, but was looking for something less dense. I haven’t cut into it yet, but it looks, feels, and smells AMAZING! My two young sons love my fresh bread. I look forward to serving it to them for breakfast tomorrow morning. I am fixing to try this recipe today. It looks promising! I’d like a 2lb loaf, any idea of how to tweak the recipe for me so I can make a larger loaf? This has to be the most amazing breadmaker bread that I have ever tasted. Was about to give my breadmaker the bottom shelf status also until I tried your recipe. Thanks. Hi, 1 cup of the flour is 150g or 240ml? it’s both 🙂 Grams (g) are a measure of weight, and milliliters (ml) are measure of volume.